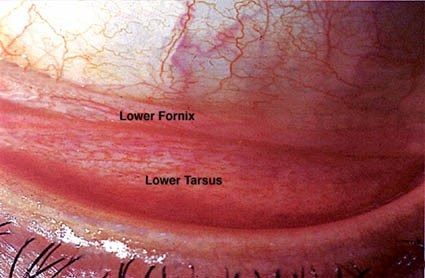 A symblepharon is a fibrous tract that connects bulbar conjunctiva toconjunctiva on the eyelid. Atopic keratoconjunctivitis: This is a hypersensitivity to environmental allergies including asthma, rhinitis, dermatitis and eczema. Trichiasis: A lid abnormality in which eyelashes are misdirected towards the eyeball. These misdirected lashes may possibly often be the result of scarring. Toxic epidermal necrosis (TEN): A potentially life-threatening disorder which is commonly drug-induced. Problems are related to the destruction of Goblet cells and a lack of conjunctival mucus which leads to keratinization and scarring. reduce inflammation, vascularization and scarring. The use of human amniotic membrane for the surgical treatment of an ocular surface disorder was initially reported by de Rotth 16 in 1940. During the 1990s, the role of amniotic membrane transplantation in treating a variety of ocular surface defects and abnormalities has been revived.